Is the course focused on creating transformational learning experiences for students or does it have more of a check-the-box feeling? Is the course built around high-quality content and engaging readings? Is there a charismatic human personality driving the course and course content? Does the course facilitate authentic and meaningful connection and collaboration between course participants? In the table below we explain what makes our self-paced core courses unique in the industry. Transformational Learning Experiences, Not Check-The-Box Most online courses we reviewed focused on what to think, rather than how to think. The guiding principle of many courses seemed to be fulfilling state standards rather than transforming the minds and hearts of course participants. Our self-paced courses are built around The Williamsburg Curriculum which teaches students how to think and intentionally develops both intellect and character. We designed our self-paced courses with the goal of transforming students’ minds and hearts. Our self-paced courses revolve around recordings of authentic live classes with real mentors and real students rather than pages of stale text and random videos. High-Quality Content And Engaging Readings Most online courses we reviewed were essentially online, interactive textbooks with multiple pages of text and occasional matching or multiple-choice activities. Most assignments felt like busy work. Our self-paced courses are more than an online textbook. They engage students through the use of video, text, and meaningful assignments. Class recordings - We’ve taken our highest rated mentors and classes and trimmed them down to the best content. Excellent readings - Students read the same classics and great ideas used in our live classes. Streamlined assignments - We acknowledge that assignments in self-paced courses are more limited than in live courses. Our solution is to streamline and require fewer assignments so the course has sufficient accountability but focuses more on learning than busy work. Charismatic Human Personality Driving The Course Most online courses in the industry lack human personality. In fact it seemed to us that the designers of many courses worked very hard to remove any human personality that surfaced from the course designers, creating courses that feel very professional and rather sterile. Most courses revolve around long passages of text, with only occasional activities or videos. The few courses that used a human personality in video throughout the course tended towards a presenter with a very formal tone and vibe rather than the authentic, mentorial vibe we prefer. Our courses are built around edited and condensed video recordings of live classes. These classes are led by mentors who were selected for their role because they are inspiring and encouraging, charismatic and caring. The videos we use are therefore infused with the personality and humanity of the mentor and our students, and nearly every lesson includes video content. Authentic and Meaningful Connection Most online courses we reviewed had zero or very few opportunities for students to engage and connect with other students in the course. Students interacted almost exclusively with automatically generated and graded assignments. This made the courses feel two-dimensional and monotonous. We utilize the best educational technology to create multiple opportunities for student connection. 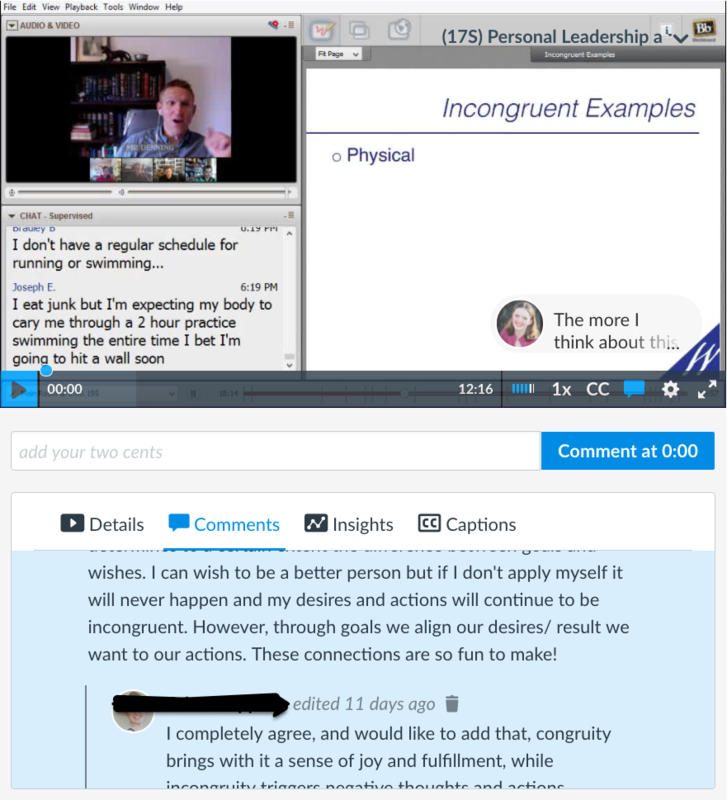 Our class videos are delivered using Arc, an innovative program that allows students to interact with each other and mentors while watching the videos using a chat feature. Students also engage in meaningful and ongoing discussions in the courses. 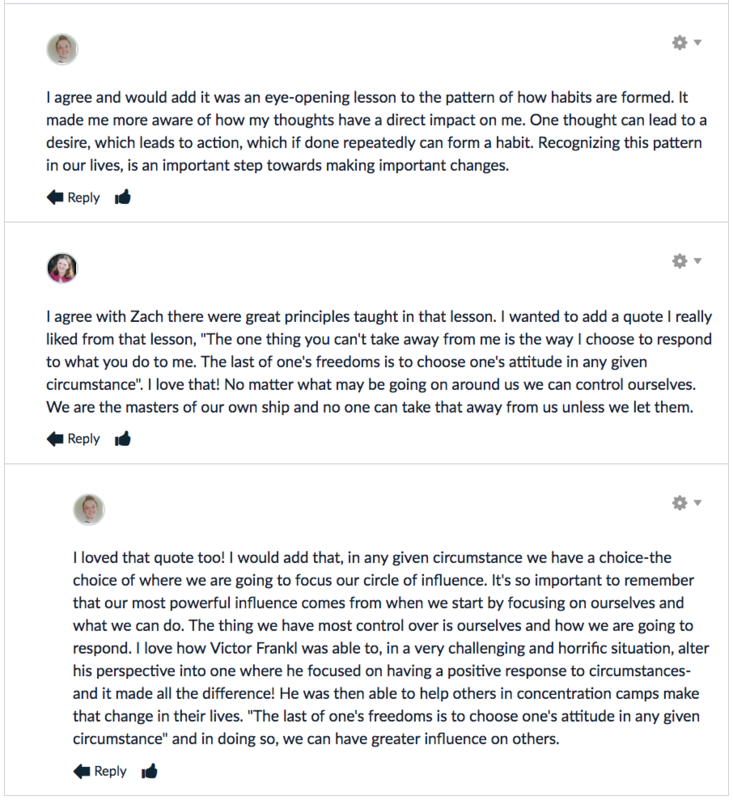 For example, in the discussion below, students share epiphanies they have from the readings and lessons with each other. Caring mentors are actively involved in the Arc and assignment discussions and can be accessed for personal help via weekly office hours.